… like the lightning bugs that are just emerging for the season. More and more grace the darkness each night. Sometimes they even find their way into my bedroom and dazzle me with their light. 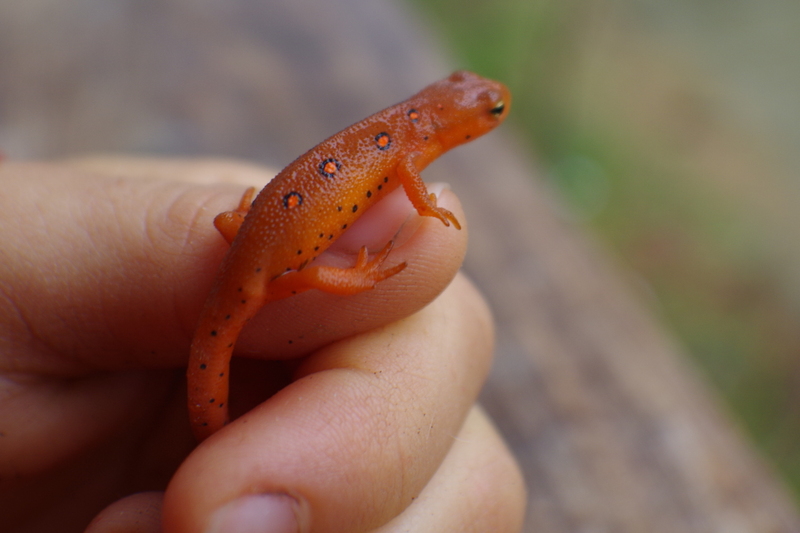 … and like the red eft. Magical woodland creature that it is. … and like the lambs, eighty-some of them now, schooling together like fish and doing their popcorn dance just for the fun of it. … and these. Especially when they are fried in butter. … and sun-bathing at the creek. The air still chilly, but the sun oh-so warm. 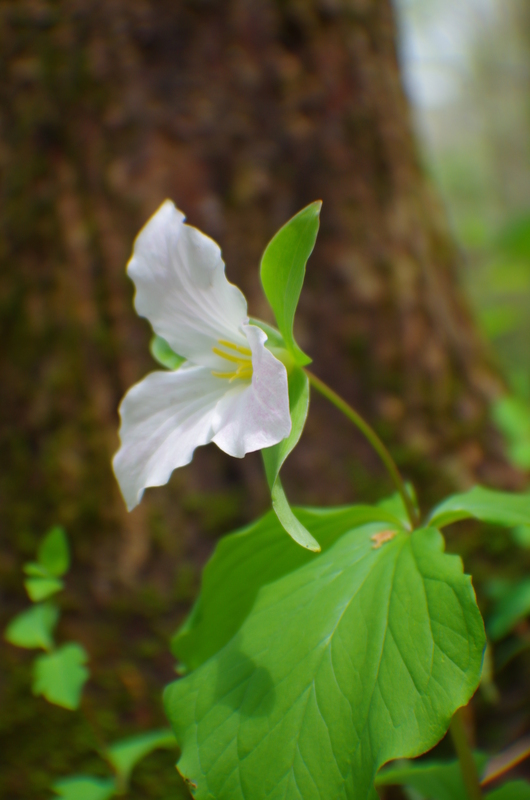 … and hillsides covered in these, white trilliums, swaying and dancing in the breeze. … and driving through the pasture and smelling a black cherry tree in full bloom. There is no other smell like it on the planet. Really. Truly. I have so much to be thankful for. I could go on, but I won’t. Thank you for letting me share my thoughts here, and for reading along. I feel better already. I hope you do, too. So far, my little local bees seem to be thriving. They made it through our fairly harsh winter and are very busy with the important work that they do. They were so busy, in fact, that I was worried they might swarm. I also thought that the hives might be getting crowded and could use the extra space of a honey super. I don’t keep the bees just for the golden nectar that they produce, I keep them for many more reasons than that. But, but… my family sure wouldn’t mind to harvest just a little honey from the bees this year! Once I got into the hives, I realized that they were not yet over-crowded and I did not see any signs of swarming… no queen cells that I could find which is just fine with me. 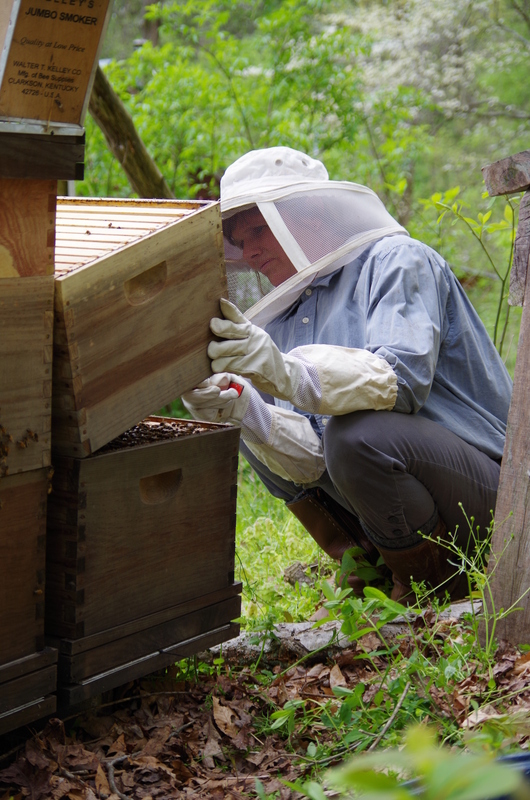 When I open the hives, I generally do not pull the frames out of the hive body itself. I always feel like a big awkward destructive bear. Instead, I look down into the frames from the top and will then tip the hive body on it’s side so that I can look up into the frames from the bottom. 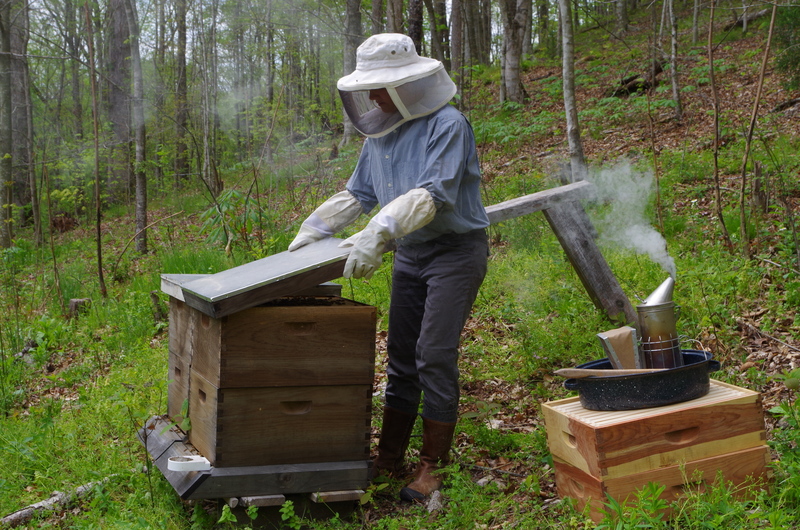 Most of my beekeeping over the years has followed a more instinctual path. I am not a pro beekeeper by any means, I just like having the little critters around. I keep my bees in the standard Langstroth hives. I am very interested in trying out top-bar beehives someday, but I just haven’t made that move yet. 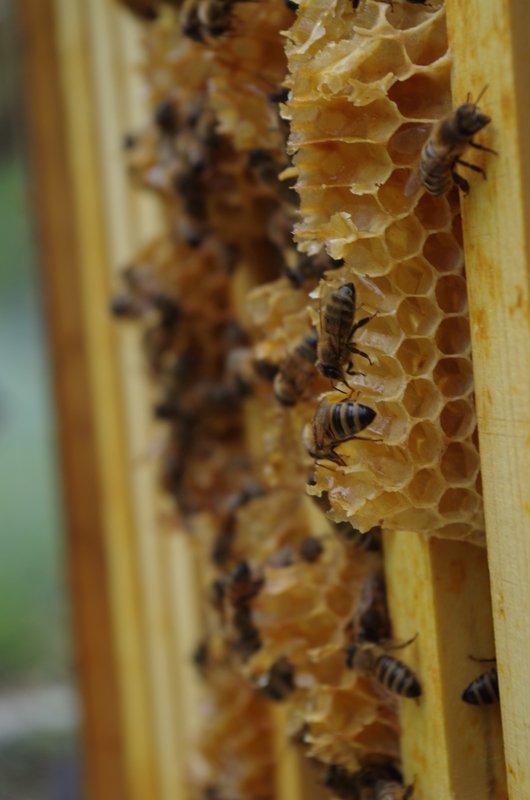 Last year I did try out a new type of frame, called a foundationless (“foundation” is the thin sheets of beeswax that you place in the hive to give the bees a guide where to build their cells) frames, that allow the bees to fully build all of their beeswax cells themselves and not necessarily be locked into the rectangular shape of the frame. The beekeeper does paint a small bead of beeswax across the top of the frame as a subtle guide, but otherwise you leave the beeswax construction up to the bees. I’ve never seen a wild hive that is rectangular! 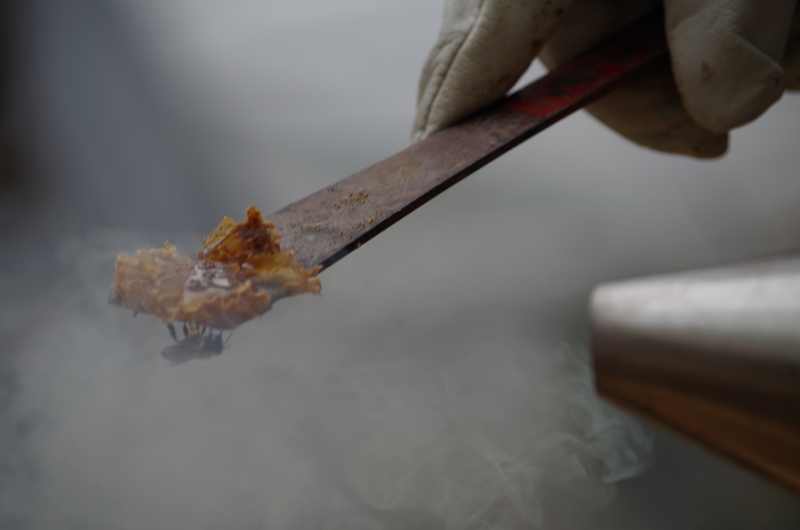 Plus, the production of fresh wax is very cleansing for the bees… kind of like us humans having a good old sweat. I could certainly see where these frames could prove problematic for the commercial beekeeper, but I’m more concerned about the health and well-being of the bees. So after a good look in my hives, and putting on some honey supers just in case, I will leave the bees alone for a while. 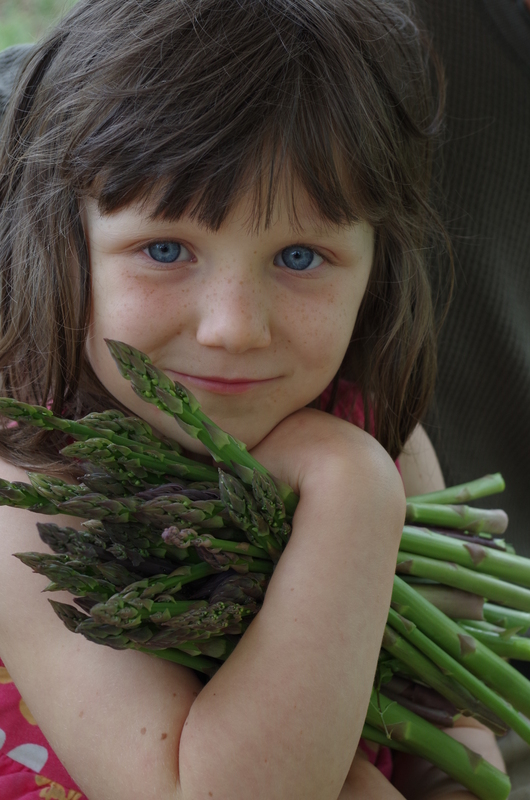 I will watch them from a distance, say hello to the hard-working little foragers when I see them in the gardens or orchard, and do my best to create health-giving farm environment in which they can thrive. I sure do appreciate having them as neighbors! these are the leanest times on the homestead. maybe lean is not the right word, boring is really more accurate. while the cupboard still holds some canned delights and the freezer still has a smattering of this and that, we are basically sick of our winter diet. spring greens are growing, but that enormous salad that we all crave is still out of reach. 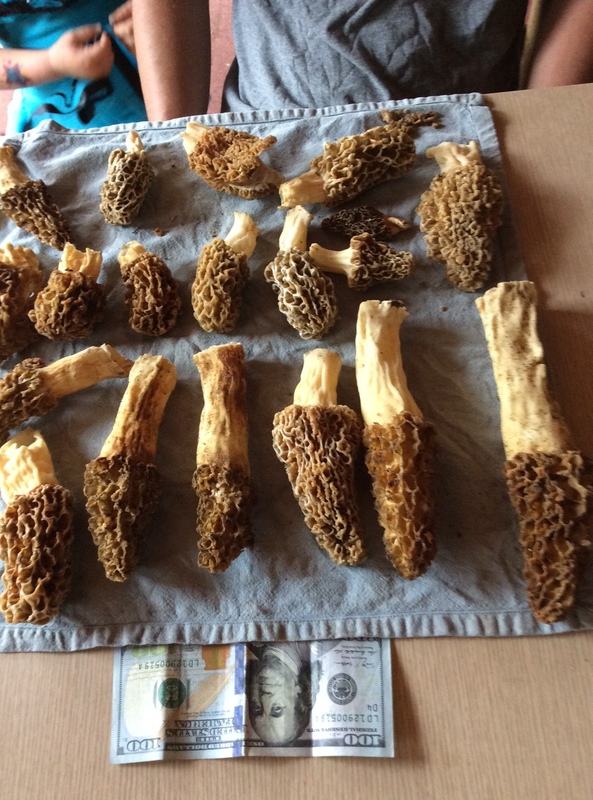 miraculously the woods offer one of the tastiest treats, morel mushrooms, around here called dry land fish. 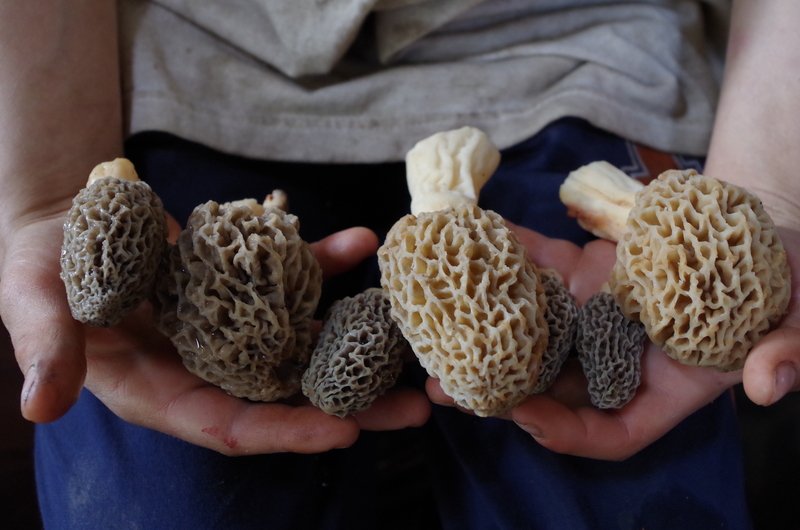 my oldest is a decent forager and right after a boring breakfast of eggs, again, he fled to the hills. the hundred dollar bill was laid out for scale my teenager claimed, not the assessed value!